Once upon a time, all it took to be a leading man in Hollywood was a great jawline, a raging cocaine habit and the ability to run and fire a gun at the same time. But in this anxious age, we require a little more from our movie stars: we want them to be decent, down-to-earth, smartly dressed, happily married (human rights lawyers are very in at the moment) and even—perhaps trickiest of the lot—ordinary. 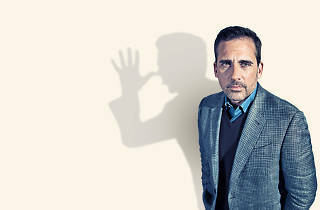 All of which might explain why Steve Carell represents the bleeding edge of modern Hollywood cool. The father of two has been with his wife Nancy for almost a decade, with nary a hint of marital strain. He doesn’t yell at paparazzi. He’s never fallen out of an L.A. nightclub at 6am. You could take him home to meet your mother and they’d end up chatting about comfy sweaters and the best way to retile a bathroom. But isn’t that all a bit, well, boring? In Carell’s case, not remotely. For all his backstage blandness, the comedian-turned-actor has proved himself a riveting screen presence, at once easygoing and unpredictable, sweet-natured and slickly hilarious. Following an early stint as a roving reporter for news satire TV series The Daily Show, Carell proved his lead-role worth with a hugely popular, seven-year, Emmy-nominated, Golden Globe-winning turn in the US version of The Office, transforming Michael Scott into a far deeper, more complex character than David Brent, Ricky Gervais’s sneering original. Admittedly, Carell’s big-screen career has been patchier. The one-two punch of The 40-Year-Old Virgin and Anchorman showed his chops as both romantic lead and gifted comic foil, while a voice role in the Despicable Me animation franchise confirmed his bankability (the billion-grossing sequel has become the single most profitable film in Universal Studios’ history). 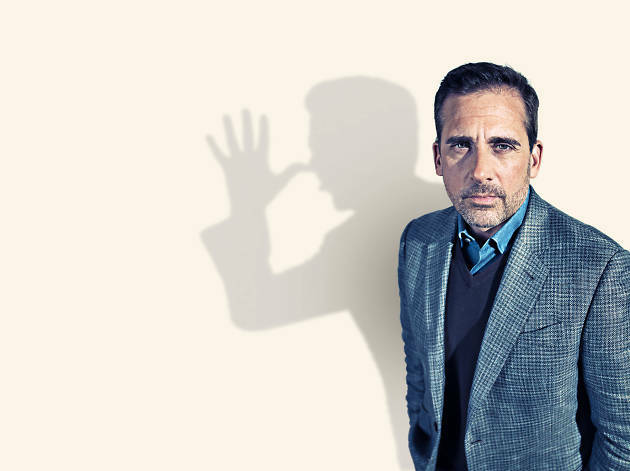 However, costly flops like Evan Almighty and Get Smart have led to accusations of coasting, and there’s a nagging sense that Carell has so far been wary of venturing outside his goofy, light-entertainment comfort zone. That’s all set to change with new movie Foxcatcher, the true story of wrestling-obsessed multimillionaire John du Pont, whose privileged background masked a dangerous personality disorder. As the murderous du Pont, Carell is barely recognizable behind wrinkly make-up, a mighty prosthetic nose and a scowling, bullish demeanour. Are you happy with your image as the straight-talking family man who doesn’t get into the gossip pages? It’s who I am. It’s not an invention. No one’s going to sell a picture of me at the dry cleaners for any amount of money. I have a wife and two kids. This is what I do for a living. There’s nothing very salacious about my life. Do you think that Hollywood is more down-to-earth than it used to be, say, in the drug-fuelled ’80s? Hmm. Do you think there are more normal people or do you think we’re just on our best behaviour? If I did something terrible, you could tweet about it instantly and thousands, if not millions, of people would pick up on it. It’s nice to think that we’re all genuine and nice, but part of me thinks that people are just watching their asses a little bit more. So Twitter is now Hollywood’s conscience? Well, I hope that I have always conducted myself in a consistent manner. The advent of social media isn’t my reason for being a decent person. If you see yourself as so unremarkable, to what do you attribute your huge popularity? Ha! That’s such a loaded question! Why am I popular? Well, it’s like I won the lottery. I never had an inkling that any of this would happen. I wanted to work and to raise a family. That was the goal. J. Crew, sometimes—when I want to go upscale. Apart from property, what’s the priciest item you’ve ever bought? We bought a Dyson. Spending $700 on a vacuum cleaner seemed crazy to me. But you see those commercials with the cyclonic action and it’s just like: Wow! I think we need to have that! Most of the time, though, I don’t feel the need for the finer things when good will suffice. Didn’t you get a thrill of transgression when you splurged that $700? Not so much a thrill, more a kind of Catholic guilt. One time I was in Bergdorf Goodman in New York and I saw a very nice shirt, a plaid sports shirt, nothing fancy. I took it to the cash register and it was, like, $250, which is way more than I’ve ever spent on a shirt. I hesitated, but I was already halfway into the process, so I bit the bullet. Then because of that guilt, I felt I had to wear that shirt until I got my money’s worth. I figured if I wore it 100 times, that’s $2.50 per wearing. Does your acting cheap like this ever frustrate your loved ones? Well, it’s not like I’m cheap; I just don’t see the need to overdo it. Is having a fancy shirt going to make you feel better about yourself? And if so, what does that say about you? Was your decision to take such a serious role in Foxcatcher related to where you are in your life? You’ve turned 50, you’re established; is it time to start playing around with how you are perceived? I don’t worry about how people see me. If you start taking roles based on that, it’s not helpful and it won’t point you in a creative direction. I did it because I thought it would be great—that’s all. Did Foxcatcher director Bennett Miller ever say why he approached you for the part of John du Pont? I don’t think I was on any of his initial lists. But my agent, unbeknown to me, called him up and threw my name in the hat… my hat in the ring… my head in the hopper? It was in part a play on my public persona. Like me, John du Pont was seen as a very benign person. People didn’t expect him to do all that he did. As a comic actor in a straight role, do you look to someone like Robin Williams for inspiration? Absolutely. I was a huge fan. I don’t know of another actor who had such diversity. He could do The Fisher King and Awakenings, then go and do Flubber. I only met him once, but when he passed away I felt such a loss. There’s been Oscar buzz around Foxcatcher. How would you feel if you were nominated? I’m really going for the Nobel Peace Prize. That’s what I’m pushing for. For this movie or for your work as a whole? For my work in general. But no, I honestly don’t know about the Oscars. I’m not saying it’s silly, but you can’t put too much stock in it. Is there an award that would really mean something to you? Dad of the Year. But I’ve gotten those on an annual basis. Foxcatcher is in theaters now.